Browsing slowing to a crawl,the inability to stream, dropped Wi-Fi signals, wireless dead zones - every one of these problems is maddening in a world where getting online has become, for some, as necessary as breathing. Well, maybe not that critical, but important. If the only way you can get decent reception is to be in the same room as your wireless router, this EW1200 dual band wireless home router can help optimize your network. 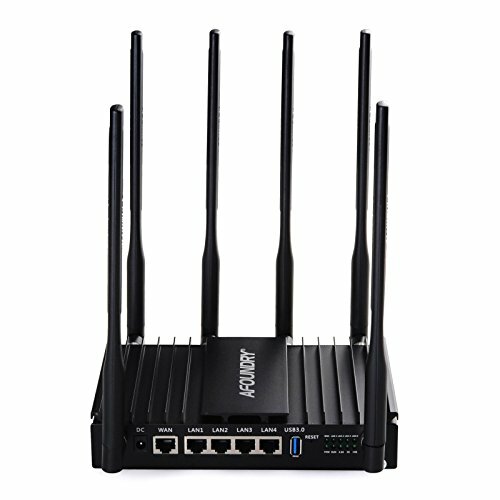 This business router EW1200 provides industry leading Wi-Fi coverage coupled with ultra-fast 802.11ac Wi-Fi speeds and deliver a combined wireless data transmission rate up to 1200Mbps. With 867Mbps wireless speed over the crystal clear 5GHz band and 300Mbps over the 2.4GHz band, EW1200 is an indoor high power enterprise-class wireless AP/Router delivering a more stable wireless connection. This is the best router for seamless HD streaming, online gaming and other bandwidth-intensive tasks throughput your entire home, backyard or office. Interference is a big issue for signal traveling, especially for those who live in densely populated areas. Signals from other wireless networks and electronics can impact speeds. Also physical obstructions, such as walls. Many phone systems and other wireless devices can also interfere with signals. So please put it in one high position or some place less interference. AFOUNDRY strives to offer the best products and customer service to our customers. If you for any reason are not pleased with any product by AFOUNDRY, please do not hesitate to contact us first and we will do our best to solve your problem ASAP! High Power Gigabit 1200Mbps Wireless Router, equivalent to 2600Mbps normal routers. Come with 6 Omni directional high-gain Antenna - Suffice to penetrate two to three walls and reach up to 400 square meters of coverage. Equipped with three processors MT7621 + MT7612EN + MT7603 - 3 core processors working simultaneously, provides even better wireless performance, transmission rates, and stability without drops and lags. Supports IEEE 802.11ac standard - The newest generation of WiFi technology. Total transmission rate up to 1200Mbps. Support 100 devices online . Cover with metal shell - Good heat dissipation makes the router more stable and reliable. One USB3.0 port offers you a quick access to share picture, movie and video with your family via FTP server.